XTCT is a variant of the legendary TCT on-board preamp. It has Bass, Mid, and Treble controls with very low noise and wide adjustment range. The XTCT became so popular that the TCT was briefly discontinued, although we brought it back due to high demand once it was known to be used by the brilliant Marcus Miller. Like the TCT, the XTCT has vintage FMV (Fender™/Marshall™/Vox™) frequency controls so each band affects the others and if all bands are set to minimum, the output is muted. This active tone control has the same tonal response as the early Fender™ amplifiers with Treble-Bass-Presence controls. The Bass and Treble controls give about 12dB boost or cut at 50Hz and 6KHz, respectively. The Mid control can cut up to 16dB at 500Hz, instead of 300Hz like the original Fender™ Presence control. An MCT mid boost module can be added for boost of the mid for full 3-band control. 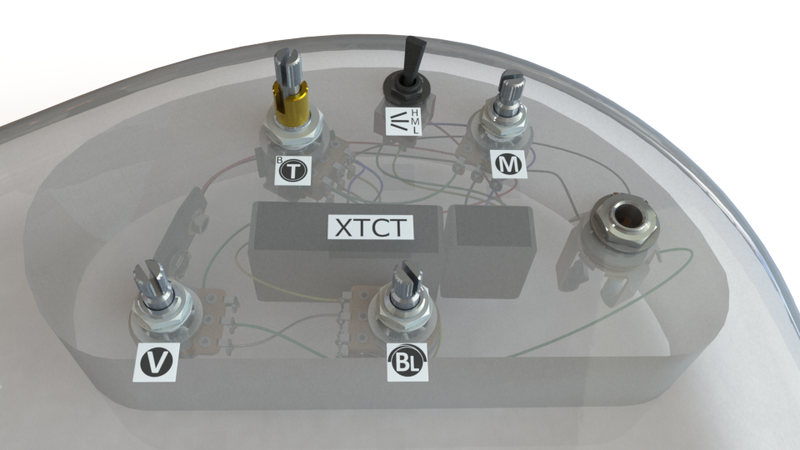 The XTCT includes a boost signal that can be used by professional guitar technicians to further increase the output gain or shape the frequency response. Because they rely on electrical current feedback for amplification, the tone is very well suited for high-output guitar setups. The XTCT delivers very satisfying frequency-phase shift and asymmetric tube-like distortion when overdriven. 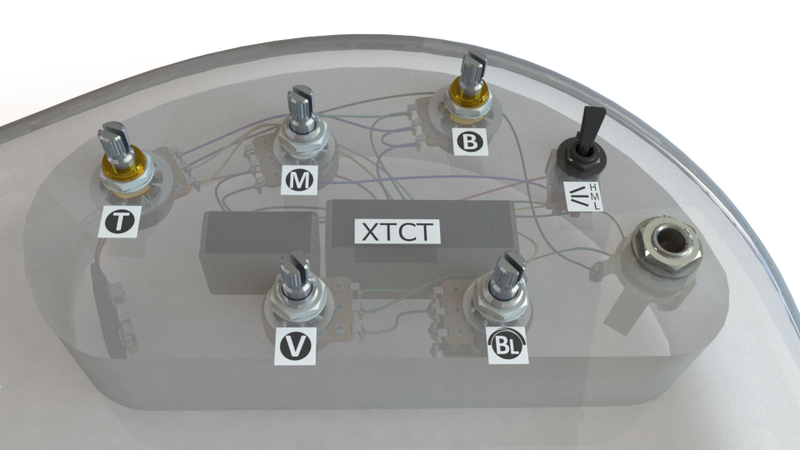 Like all of our preamps, the XTCT is internally shielded to reject electromagnetic noise and includes internal filters to block AM and FM radio on the input. Bartolini set the standard of fully sealing the sensitive electronics. We use professional double tin plated pure copper wire with durable semi-rigid insulation. This ensures the 5” pre-stripped wires don’t flop around in the cavity and the wires don’t cut through the insulation over time. The XTCT Family is a vintage, complex design with a limited yet loyal following. Most musicians prefer the ease and flexibility of our more recent products. Thicken or thin your tone with mid control. XTCT has native mid cut for classic slap tone. The cut depth can be set with an in-cavity trimmer.